Minimum Social Bond Amount: No minimum. Legally Binding Commitment: we agree to voluntarily convert any pledges relating to this Ask into a legally binding, enforceable agreement. For social bond applications of up to £1,000, the social bond holder can chose from a list of charities/NGO's chosen by all MBU social bond holders. For social bond applications of £1,000 and above, the social bond holder can select a charity/NGO of their choice (subject to verification by MBU). both our social bond holders as well as society at large. to support the causes that matter to them. You decide where some of our profits will be spent. on global social well being. 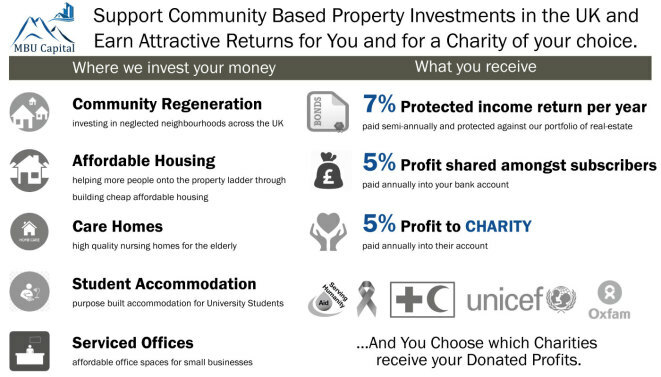 With a natural talent of spotting great property investment opportunities and converting them into cash whilst delivering wider social benefits. Many years of individual track records of success in managing substantial multi-million / billion dollar investment portfolios. Hands-on experience of property developments and management. Extensive contact network of property agents, surveyors, architects, planners, builders, maintenance contractors, marketing companies and fund managers. Massive reach within all circles of global financial markets. An early stage company but with a mature infrastructure and highly experienced and capable team ready to catapult into a phase of rapid growth and success. 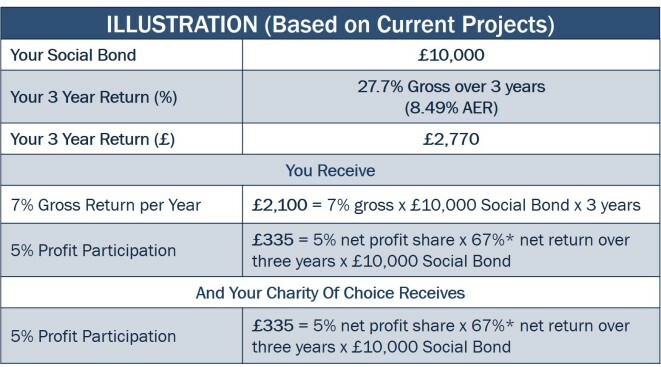 Please see www.mbusocialbond.com for more information. Q: How do I apply for the MBU Social Bond? A: Click the 'Give to this Ask' button at the top right corner or at the bottom of this page. You will need to create a Re-Give user account after which you can proceed to the Payment section where you will be presented with a selection of Payment methods. The cheapest method of transferring money for the MBU Social Bond will be to use the bank transfer method. When using this method please ensure that you include your Re-Give unique ID number (generated when you select the Bank Transfer option) as your payment reference in the transfer instructions from your bank. Q: How long is MBU's Social Bond offer open? A: There is no closing date at this time, but MBU may opt to cease this offer at anytime without any prior. Consequently, we encourage early participation. Q: Do I get interim valuations and/or reports? A: Yes, we will post regular updates on Re-Give and on our website (www.mbucapitalsocialbond.com). We will provide regular valuations of our property holdings to ensure that we provide complete transparency into our business operations. Q: Is there a subscription fee? A: No, neither Re-Give nor MBU Capital will charge you any subscription fees or charges at all. Q: How is the Social Bond secured against property? A: The primary use of proceeds from the social bond will be for Real Estate Investments. These proceeds will be secured against MBU Capital LTD's portfolio of investments. Q: Can I sell my Social Bond? 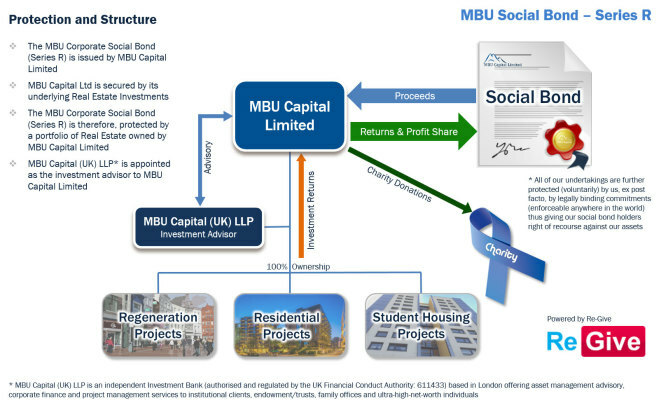 A: The MBU Social Bond comprises a gratuitous promise between MBU Capital LTD and the Giver. This is then voluntarily enforced, ex post facto, by MBU into a legally binding commitment (a “Deed Poll”), which is transferable. Q: Do I receive a certificate after applying? A: Yes, you will receive a confirmation by email from Re-Give. A copy of this will also be on your Re-Give Account. 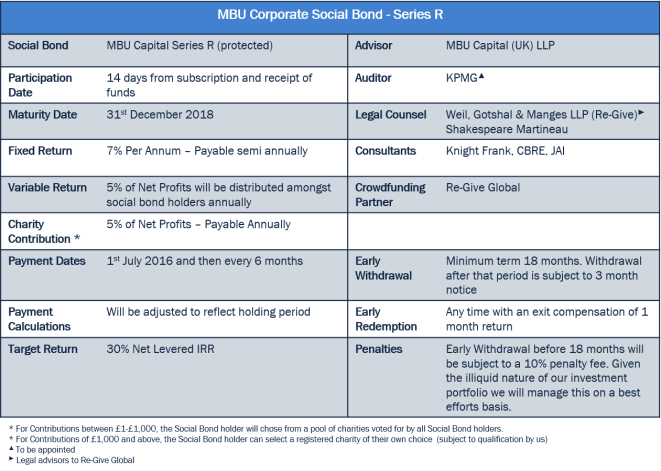 The MBU Social Bond comprises a gratuitous promise between MBU Capital LTD and the Giver. This is then voluntarily enforced, ex post facto, by MBU into a legally binding commitment (a “Deed Poll”), which will be sent to you by email separately. Q: What is the minimum social bond amount I can apply for? A: We have set no minimum amount to that everyone can participate in real-estate returns. Q: What is the maximum social bond amount I can apply for? 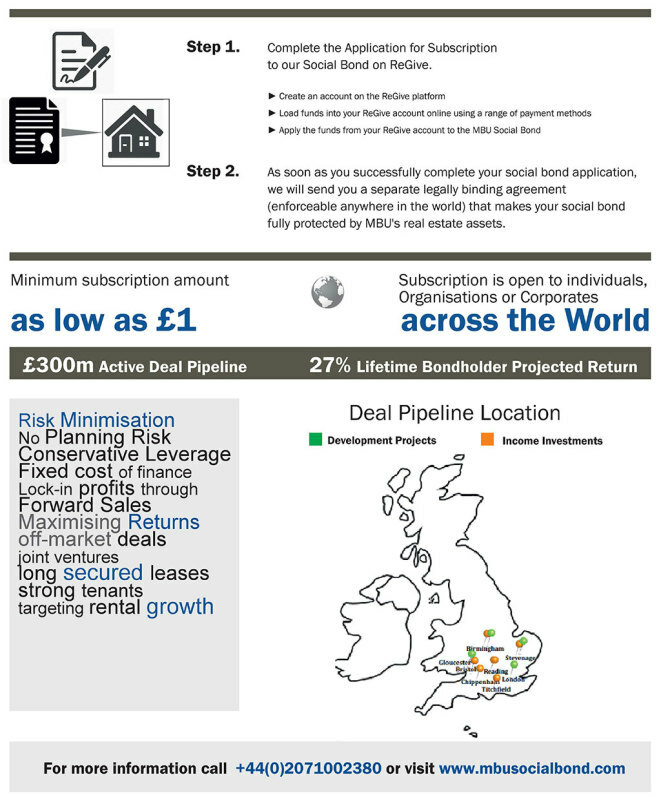 A: We have set no maximum amount as we have secured a substantial deal-flow pipeline of UK real estate investments. Q: When do I start earning a return? A: Your contribution will start earning a return 14-days after Re-Give has received cleared funds (we call this the Start Date). The 14 day period is to allow you with a cooling-off period, just in case you change your mind. 30th June 2016: Payment of 7.0% x Amount of Contribution x No of Days of Contribution (30th June 2016 less Start Date) divided by 365. 31st December 2016: Payment of 7.0% x Amount of Contribution x No of Days of Contribution (31st December 2016 less 30th June 2016) divided by 365. Q: Do I get a periodic account statement? A: You may check all your Re-Give account transactions on the regive.org website. Q: Are there any transaction charges? A: Both Re-Give and MBU Capital LTD do not charge any transaction fees. However you may be charged banking charges/card processing fees (depending on your method of payment) when you transfer funds to Re-Give. Please check with your payment service provider. Q: How do I choose a charitable cause? A: For contributions of up to £1,000 (or equivalent currency) we will introduce a mechanism of “voting” for charities. Each holder of the MBU Social Bond within this contribution band will be contacted by 31st December 2016 and will be asked to nominate a charity for their contributions. Once all votes have been counted, we will allocate our contributions on an equal basis to the top 5 most voted charities. 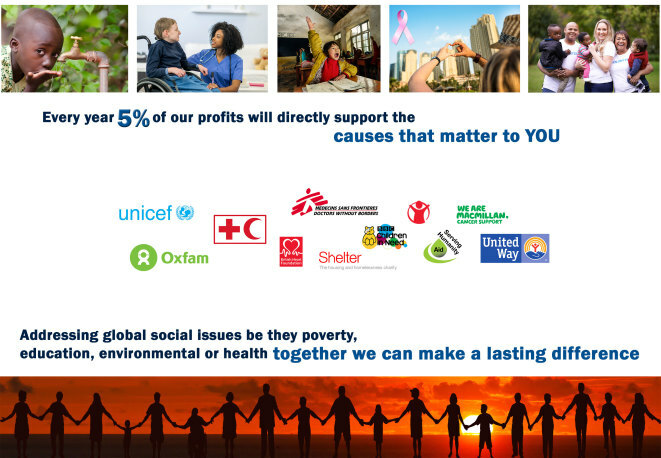 This allows our social bond holders to directly influence the choice of charities that we will support. For contributions of over £1,000 (or equivalent currency) we will contact the social bond holder before the 31st December 2016 and ask them to nominate their charity of choice. Subject to charitable status verification and due-diligence, we will then make a direct profit contribution to our social bond holder’s charity of choice. A: Please be aware that as with all similar financial transactions, your capital may be at risk. However, to mitigate capital risk: MBU will, ex post facto, voluntarily convert its pledges and undertakings related to a specific Social Bond into legally binding commitments (enforceable anywhere in the world) and make a copy of the relevant documents available to all of its relevant social bond holders, who would thereafter have a right of recourse against MBU’s assets. Please also be aware that the MBU corporate social bond does not fall under the UK Financial Services and Markets Act (FSMA) or the Financial Conduct Authority (FCA) regulations and the Financial Services Compensation Scheme (FSCS) and the Financial Ombudsman Service (FOS) does not apply to it. See Risk Warning for more information and seek professional advice if you do not fully understand the information contained within our Social Bond documentation. Q: How do you intend to manage business risks? We mitigate and minimise this by selecting a fixed cost developer combined with performance guarantees to ensure there are no project and budgets over-runs. Before we commit to construction on any of our projects we maximise off-plan sales as much as possible. In instances such as PRS (Private Rental Schemes) and with financial institutions, we aim to secure 100% of the exit before we commit to a development project. We will use Tier 1 external agents such as Savills, JLL and Knight Frank to assist in our pre and post sales model. All financing is secured before we commit to a project. Project financing is nearly always on a fixed interest rate basis (to minimise any interest rate risk). Financing is for the full duration of a project – with precautionary provisions. We only select projects with full planning permission, eligibility for permitted development or where planning consent has been pre-agreed in some form by local authorities. There is always a risk of project over-runs, but we minimise this by selecting credible service providers with extensive track records. We also ensure, where possible, that we have adequate compensation schemes in case of any significant over-runs. Q: Is the MBU Social Bond Sharia compliant? A: The returns are offered as a gift/reward (hiba), not as a contractual interest payment (riba). Also since the contribution itself carries normal business risks and there is also profit participation, we are satisfied that the MBU Social Bond is sharia compliant. Q: Can I know where my money is invested? We will post regular updates on Re-Give and on our website (www.mbucapitalsocialbond.com). We will provide regular valuations of our property holdings to ensure that we provide complete transparency into our business operations. Q: What if I need my money back before the 3 year term (before the maturity)? A: There is a minimum hold period of 18 months. After this, you will need to give us 3 months notice in order to withdraw. Please note that you will not receive any additional returns during this notice period. If you need to withdraw before the 18 month minimum hold period, you can do so but you will be subject to a 10% penalty fee (deducted from your original contribution amount). Given the illiquid nature of our investment portfolio we will manage this on a best efforts basis. Q:What is the procedure of withdrawal before maturity? A: To request a withdrawal, the Giver must send a written notice, with their full details including their unique participation number to Re-Give and MBU Capital Ltd.
Q: Do you pay any tax at source on my returns? A. No, we do not. All payments are made to you gross. You are responsible for paying any applicable tax. Q: Can MBU repay the Social Bond earlier? A: Any time with an exit compensation of 1 month return. Q: Can my Social Bond Application be unsuccessful? A: MBU may decline to accept or cancel your contribution without notice and without reason but will refund any contribution amount you may have transferred.